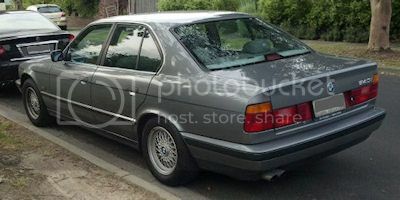 last year i purchased an e34 540i, i drove it for about 2 months during the summer and everything was fine apart from abit of a rough idle which wasn't too noticeable. i parked it for the winter and it sat for about 4 months, i didnt try to start it during that time. i got it out 4 days ago, changed the oil, replaced the battery and tried to start it with no luck. it cranks and sometimes tries to fire but doesn't start. i sprayed some starter fluid into the intake and it fired up but stalled right away, i then disconnected the fuel line to check if there is pressure and it was there, but the fuel pump only goes on when the engine is cranking. when i put the key to the on position the pump doesn't go on. i then cleaned the Airflow sensor and tried to start again with no luck. i starting to run out of ideas. Check the fuel pressure. Should be over 50psi. Check fuel filter aint clogged. If it comes down to the fuel pump bench test it first to see if it works before investing on it. i haven't tested the fuel pump with a gauge but there is pressure in the fuel lines, i tried clamping the fuel return hose and that didn't help, so I believe the pressure regulator is fine. I'm not sure what the value for the cam sensor is supposed to be, or if that can cause a no start so hopefully someone on here knows. i took out all of the spark plugs and let the gas air out of the cylinders, i replaced the spark plugs and squirted a little bit of oil into each cylinder to lubricate the rings, then i let is sit for a few hours and i got it started but not for long it runs for a few seconds and dies, when i open the throttle it dies right away. does that mean that i need a new fuel pump? or is the fuel filter clogged? I wave my private parts at your aunties you empty headed animal food trough wiper. cleaned out the icv with airflow sensor cleaner and it still does the same thing. What psi is your fuel line at? Post it here once you test. I too think it's fuel delivery. Last edited by dantheman67; 05-30-2012 at 12:58 PM. definitely a fuel issue. Almost like... you're out of gas? It really sounds like the fuel pump. They can sometimes be intermittent and not put out enough pressure to make you believe that it's working....almost. Test the fuel pressure, I can bet it's low, but not zero. Then replace the pump. I think you can rent the pressure tester some where. I have the same issue here!! 540salo, I have to agree in regards to fuel pump and/or fuel filter. I have 01 540i, with 169,000 mi that acted very similar, i checked for fuel and was receiving, however the pressure wasn't enough. I would get enough to stand at idle but not enough to run with any throttle applied. The task is very simple. Also, it is beneficial to change the fuel filter while in the process. Haven't been on here for a while but I did figure out the problem, it wasn't the fuel pump, turns out it was just old gasoline. Aperantly gasoline contains 10% ethanol which cannot sit for long because it captures moisture and lowered the octane level of the gasoline. I did end up replacing the fuel pump which didn't solve the problem so I figured I should drain the gas tank and put new gas in, so I pumped out the old gasoline, put the old fuel pump back in, added some fresh fuel and it fired right up. Hello everyone, my bro's. PC does not start. I press the power button and all I get is a black screen. I opend up the PC and everything seem to be normal. All fans work, I tested the PSU and it seems to be working, I also reseted the CMOS and nothing, I also removed the battery and put back , nothing happened. Any ideas of what could it be? What else can I try. This is not a forum for PC diagnostics. FWIW... Remove all cards not needed. Retest if no startup of BIOS firmware to a screen display, the system board may be blown. Common problems are the large capacitors on the board are commonly good for only a handful of years, then the "tops" actually blow off. If you see that, the system board is gone, and frequently blows up the BIOS chip in the process. It can also blow the processor also. I now notice when it gets below 60% full sometimes it wont start 1st time cold, i.e. cranks for as long as I turn the key, if I stop and leave it 2 sec and crank again it fires up, sounds a bit dodgy for first few seconds but once idling all is good. I just noticed 15 mins ago it took 3 tries to start, and wasnt revving as per normal under power and the gauge was bang on 40, exactly how it felt when starting to run dry, filled her up and no problems at all. Amiright in assuming fuel pressure issues? anything else I should consider that might be interfering e.g. o2 sensors? Goes fine once idling well, nothing noticeable under power (still revs nice and high and goes quick), problem is confined to getting enough fuel flow into the engine when starting. edit: leaving the ignition on for 20sec before starting, fired up first time. Going to check the lines tomorrow for splits, cracks, leaks, and buy and bung in a new pair of filters, then if nothing changes a look at a new pump. My bro has several ~25-30 year old BMWs, and cleaned the tank on one: Ungodly crud in there, compounded by jellied gasoline from the ethanol crap they put into fuel in this country. Probably gets worse in cool/damp season like winter/spring due to more condensation inside the tank. (Moist air comes in to replace volume of fuel used, moisture condenses on the sides of the metal fuel tank and being heavier than fuel, sinks to bottom, making things worse.) Best to top off the tank before parking. And, since the fuel fed from the intank pump acts as coolant for the external pressure pump, and said fuel is not flowing or cooling, the external pump rapidly overheats and burns out. A very experienced and smart mechanic friend told me yesterday to disconnect the intake hose to the external pressure pump. and run the internal pump separately to make sure it's flowing properly. Do this with very little fuel in the tank, else gravity flow through an otherwise marginal or failed internal pump will still get through. In that case, you're in fool's paradise because the external pump may get enough gravity feed to run the car normally, but not enough for fast driving or acceleration, when the pressure pump will lack coolant and then overheat/fail. He says these pumps often fail simultaneously: Intank pump fails but the car still drives on gravity feed to external pressure pump, then external pump soon fails for lack of coolant. Always change filter when doing this, fuel hoses and proper stainless designated fuel hose clamps (not the cheese grater type) are wise, too. Last edited by Dash01; 12-05-2012 at 11:53 AM. This was exactly my issue, dying fuel pump was ok with gravity but parking on an incline or <60 on the gauge led to very hard starting and it would bog down when giving it loads of stick (4krpm in 2nde.g.) It finally died during driving to the mechanic about 500m away! Luckily a good slap or ten on the bottom of the fuel tank got the pump going and I managed to drive it that distance. Last edited by bennyg; 12-07-2012 at 04:49 AM.